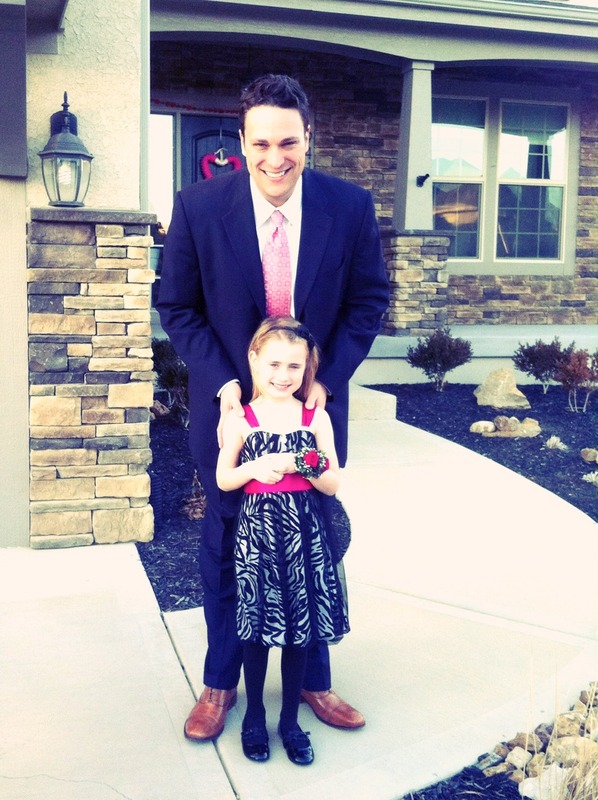 Steve got Kate a little corsage and we borrowed this sweet little animal print dress from a friend. She was in heaven! We tried to curl her hair with hot rollers. Needless to say, her stick straight hair does not keep a curl, especially in Kansas winds! She had fun getting gussied up though. Since I would be setting up and working the dance, I decided to get in on the French action too! 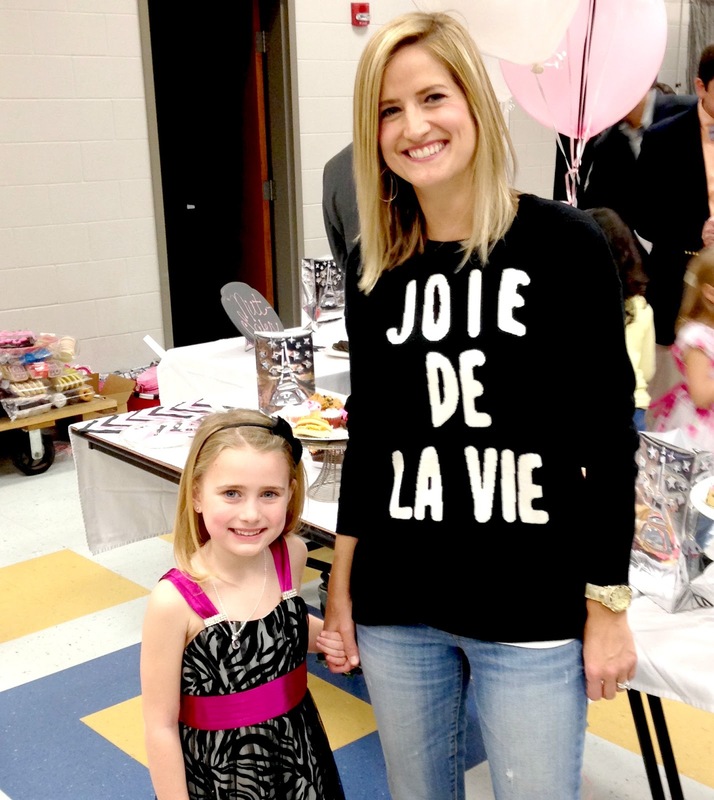 I found this fun "The Joy of Life" sweater on sale at Forever 21 and snatched it up! It's still on sale if you like! And what event that I'm involved in would be complete without the use of this DIY chalkboard I made 4 years ago for $5?!?! This thing has gotten more use than I ever imagined! 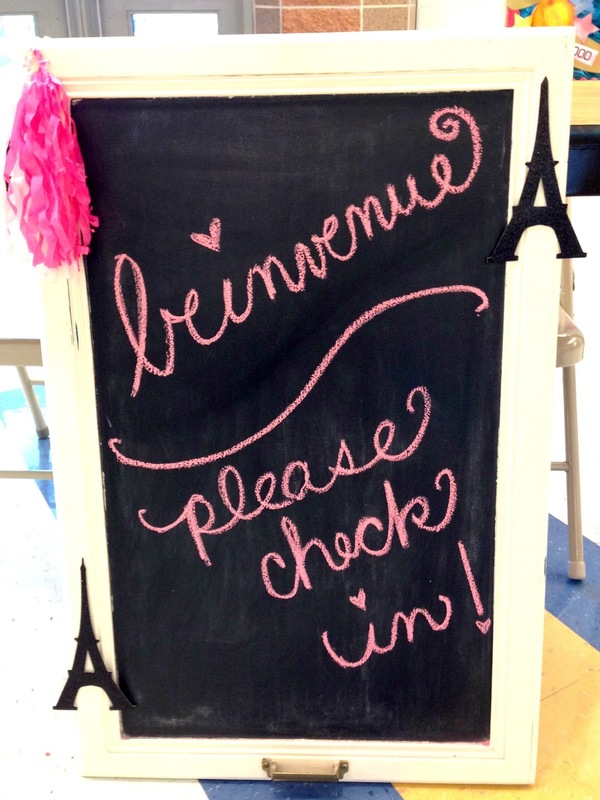 And, I spelled "Bienvenue" wrong on the chalkboard, but I'm pretty sure no one cared! Lost in translation!! We are not a huge into Valentine's Day, but it holds a special place in our hearts. It was 14 years ago, on February 14th, that Steve sent flowers to my sorority house while we were both in college at the University of Iowa. That was the real start of our relationship and I'm happy to say the rest is history! We were such babies, and I have such fond memories of our time in college together. We had a little overnight date on the Plaza last weekend, so we are playing it very low key tonight! I hope love is in the air for you today!